This episode is a Grab-bag, it contains three segments that serve as follow-ups to the three most recent episodes of Here Be Monsters. Jeff melted that hole with the soldering iron. Turn knob clockwise to slow stuff down by up to 3x. Here Be Monsters' true heroes. These are the crickets you hear chirping in this epsiode. At the Evergreen Washelli Cemetery. 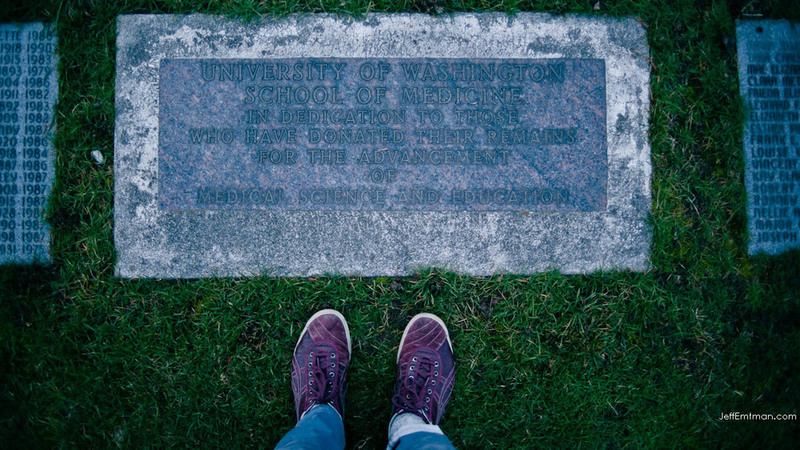 This is where the University of Washington offers free burial for their medical cadavers. This is one of the few ways to be buried for free. In this segment, Jeff takes apart his tape recorder and installs a knob to help him slow down the tape without using digital wizardry in attempts to de-muddy the waters after HBM029: Do Crickets Sing Hymns. He bought some more crickets and slowed the cassette slowed down to 1/3 speed. The results were telling, and surprising. In that episode, we were talking about the confusion surrounding the bit of audio called God's Cricket Chorus by Jim Wilson. In this segment we’ll clear up exactly what is known and exactly what is not about God’s Cricket Chorus and its derivative works. Also, a correction to a mistake we made in Episode 29 about how digital audio is constructed for our ears. In that episode we represented the final product of digital audio to be choppy, yet moving by too quick for our ears to notice its choppiness. This is NOT the case. In fact, digital audio is always converted back to analog before it hits our ears. This is done with a device called a Digital to Analog Converter (DAC). Here’s an article that explains this process very simply (Page 4 is where the good stuff starts). Big thanks to the two commenter s who pointed out this error. Want to try stretching some crickets yourself? Download this same set of cricket songs we used for the shows. In HBM027: Balancing Act, Here Be Monsters producer Lina Misitzis delved into the rich history of the Four Humors, which was, for thousands of years, the way much of world understood medicine, the body and the universe as a whole. While we never heard from Alain Touwaide in that episode, he was central to our research of traditional medicine. He’s the director of the Institute for the Preservation of Medical Traditions in Washington DC. He spoke with Lina about the foggy past and likely future of Humorism. In HBM028: Johnathan’s Cadaver Paintings, Johnathan Happ, a grad student at the University of Washington, visits one of the cadaver labs on campus. He spends a lot of time there, studying the bodies, so that he can make paintings of them in his studio. While that episode has a lot of information about the cadaver labs themselves. We never got the chance to talk about what happens to those bodies after their 3 year rotation in the lab. So, in this segment, Jeff goes out to the Evergreen-Washelli Cemetery in northern Seattle, where most of those bodies come to rest. The Black Spot ||| Half Ghost <-- New! HBM029: Do Crickets Sing Hymns? A bit of stunningly beautiful audio has surfaced online recently and it's riling up two different kinds of people--churchgoers and audio engineers. Some are saying that this music proves God's intention, others say it's a load of crap. The funny thing is that it's just recordings of bugs, crickets chirping, but with the speed turned waaaaaayyyy ddoooowwwnnn. Whatever it is, it's...undeniably "church-y". But some have argued that it's not just bugs in the recording, that there's voices or guitars accompanying the insects...it's just too good to be true. So, in this episode, audio engineer Toby Reif takes us down the rabbit hole of audio theory to help us understand how sound-stretching works, and the reasons why this long loop of cricket noises has touched so many. Jeff also buys 50 crickets in this episode to see if they'll chirp. Tune in to see what happens. 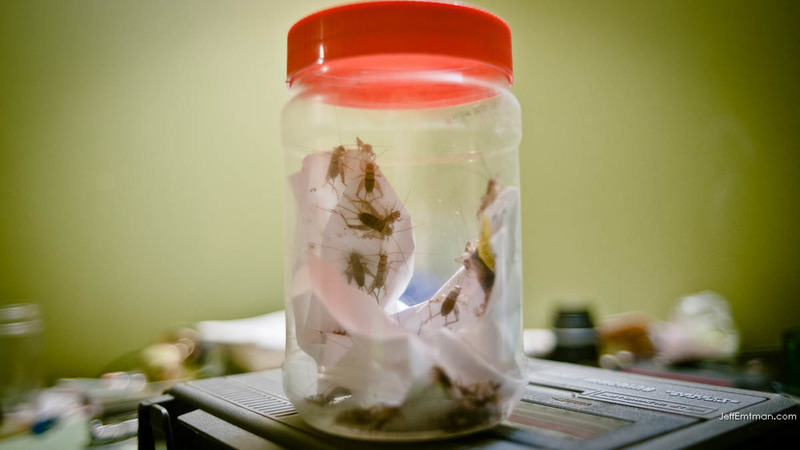 Toby and Jeff originally heard the cricket audio from a Croatian Sound Cloud user who uploaded the sounds and mis-attributed them to the theater director Robert Wilson. (UPDATE: the Soundclouder who uploaded this has since corrected much of the misinformation that was formerly in the sound's description). Here Be Monsters is a proud member of the Mule Radio Syndicate, which distributes some other really great podcasts. Check them out at MuleRadio.net. Check out Lina Misitzis of HBM fame singing Fat Bottomed Girls by Queen on our new favorite Mule Radio video podcast, It Might Get Personal! This episode is sponsored by Squarespace, the easiest way to create a professional website. They’ve got a great deal for HBM listeners. Go to SquareSpace.com and use the promo code “monsters11” to get 10% off and a free trial. Jonathan Happ’s white lab coat and latex gloves make him look like a doctor when he stands in a room full of people. But he’s not a doctor…he’s an artist, and the people he shares this room with are all dead. In this episode, Jonathan takes a recorder into the University of Washington’s cadaver lab and reports on what he sees, and why he draws and paints images of the bodies. Sensitive listeners should note that this episode contains graphic (but mostly scientific) descriptions of the cadavers. Here Be Monsters currently needs your help. We're currently just a baker's dozen reviews shy of 50 on iTunes. Go to iTunes and tell people what you think of HBM. Here Be Monsters is now a proud member of the Mule Radio Syndicate, which distributes some other really great podcasts. Check them out at MuleRadio.net. This episode is sponsored by Squarespace, the easiest way to create a professional website. They’ve got a great deal for HBM listeners. Go to SquareSpace.com and use the promo code “monsters10” to get 10% off and a free trial. For thousands of years, Western Medicine thought it had itself figured out. Everything came in fours. There were four sensations, four fluids in the body, four kinds of people, and four elements making up the world. They were all related. There wasn’t one without the other. Everything was a balancing act, and it was called Humorism. In recent history, vaccines, sterilization, and other modern treatments have pushed Humorism out of the picture. But traditions ingrained in culture, science, and religion for thousands of years don’t just vanish. While few people still eat lemons to balance their yellow bile, or willingly drain their blood at the barber shop, elements of Humorism still play into modern society. They can be hard to see, but trust us, they’re here. Hey! Review HBM on iTunes! And like us on Facebook! This episode is sponsored by Squarespace, the easiest way to create a professional website. They’ve got a great deal for HBM listeners. Go to SquareSpace.com and use the promo code “monsters9” to get 10% off and a free trial. It was 40-odd years before John Hanneman figured out what the night terrors of his youth represented. In this episode, John describes the first trauma he experienced in life—something we all share. And he explains how he overcame it to become the person he is today. If John’s voice sounds familiar, you aren’t imagining it. John appeared on the show waaay back on Episode 3: John Dips Below where he talked about his experiences diving below the waters of Puget Sound to take breathing lessons from a giant octopus.